Nice to meet you! My name is Emily. I am looking for a family seeking part-time child-care for their 2 - 4 year old, while I continue to stay home with my 13 month old son Errol. The start date is flexible. There is one spot 2-3 days/week. - Offering myself, as an experienced child care giver, to share with you! 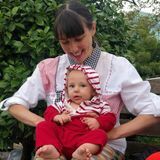 Having someone new join us at our home for mealtime, playtime, and naptime is an exciting new stage in my journey as a mother! Errol and I look forward to building a closer relationship with an exciting new friend, while Family Place in Kitsilano (a dynamic social setting for toddlers) is also located 1 block from our front door.